I often spend so much time on my main dish that I completely neglect to make a side dish. 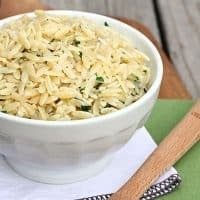 Which is why I love easy sides like this Creamy Lemon Herb Orzo. It savory side dish only takes about 10 minutes from start to finish, and my whole family loves it. It could even pass as a nice light lunch or dinner with some grilled veggies or a salad. And it goes perfectly with almost any grilled meat–pork, chicken, or beef. You can use whatever fresh herbs you have on hand in this recipe–parsley, thyme and oregano are some of my favorites. 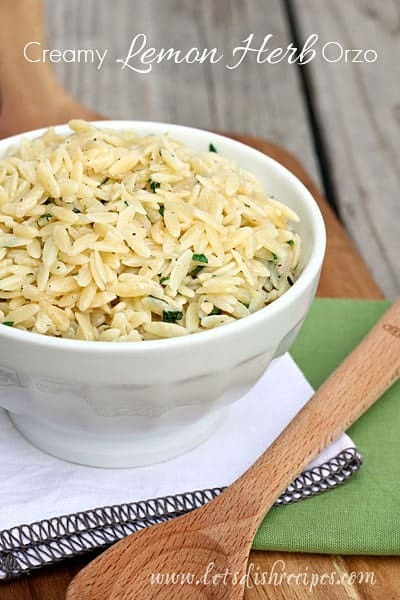 Just be sure not to overcook the orzo, since it will continue cooking when you return it to the pan with the lemon juice and cream. Cook orzo according to package directions until just al dente, about 7 minutes; drain. In a large skillet over medium heat, melt the butter. Add the garlic and cook until tender, about 2 minutes. Stir in the cooked orzo, lemon juice, lemon zest and 4 tablespoons of cream. Add the additional 2 tablespoons cream if desired. Remove from heat and stir in fresh herbs and Parmesan cheese. Season with salt and pepper to taste. Serve warm. Every ingredient in this dish, I love! Will give this a try! Thank you!! !